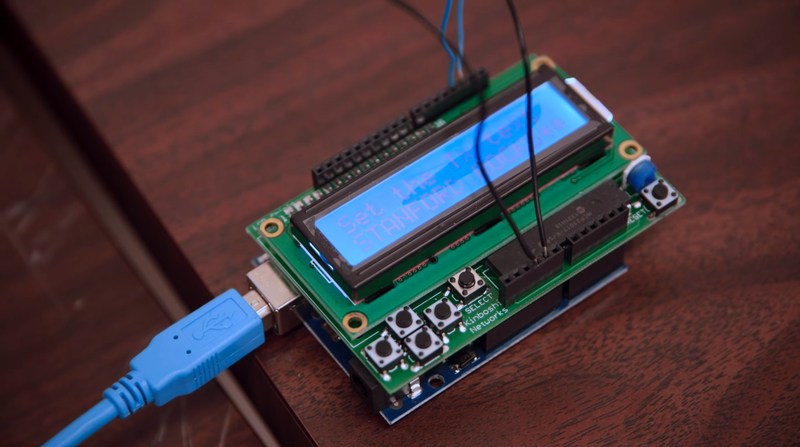 A new machine designed at Stanford University sends digital messages without electronics, using common household chemicals. Eventually, similar systems could allow tiny devices to communicate inside the body, or be adapted to environments in which traditional electronics break down. This intriguing chemical-based communication system was developed by Nariman Farsad, a post-doctoral fellow at Andrea Goldsmith’s electrical engineering lab. Though unorthodox, chemical communication opens up many new possibilities in the way we transmit and receive information. In addition to being wireless and cheap, it can work without the benefit of electronics. Consequently, it could be used in environments typically out of reach for electronic systems, such as under water or in places where metal is abundant. In a nutshell, the system turns pH changes into code, using pulses of an acid (vinegar) and a base (household glass clear) to create zeros and ones. These yin-and-yang chemicals are enough for a small sensor to detect a change in pH, and encode that change as a zero or one. Voila, instant binary code—albeit one driven by liquids instead of electronics. When using the system, the researchers type a desired message on a small computer. A signal goes out to a machine that pumps out the corresponding “bits” of chemicals, i.e. either a spurt of vinegar or the glass cleaner, which travels through plastic tubes to a small container containing the pH sensor. The changes are then transmitted to a computer that deciphers the encoded message. Farsad used these particular chemicals because they’re easily obtainable, and because they cancel out at the receiving end of the system. The potential for this system is limited only by the imagination. Scenarios proposed by the researchers include sending secret messages that others aren’t aware of, having robots message each other with chemical trails, or even substituting for conventional communications in the the event that the electric grid (or an electronic device) is knocked out by an electromagnetic pulse or terrorist attack. Excitingly, the system could even be adapted to work in the human body, in which nanobots could communicate with other tiny machines via liquid text. This concept is still very much in its early stages, and several limitations still need to be sorted out, including finding ways to transmit the signals over longer distances, figuring out how to separate the signal from the noise at the end of the system (residue is a problem), and ways to power the system. Here’s to hoping that Farsad and Goldsmith solve these issues—this idea is simply too cool to be allowed to die on the vine.